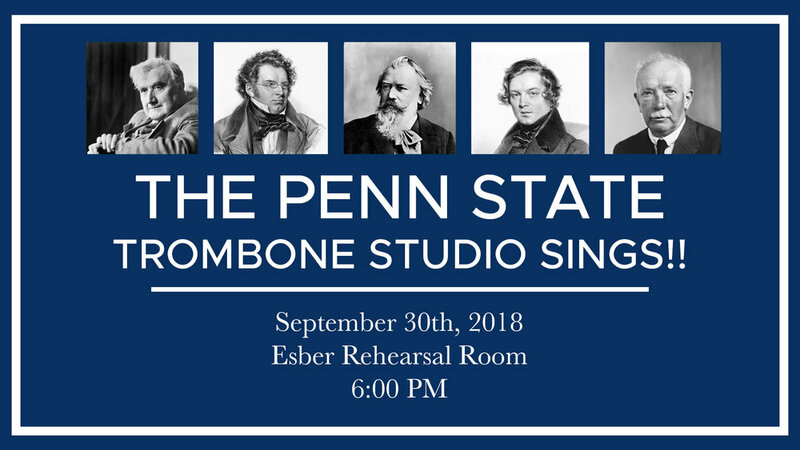 Join professor Mark Lusk and the Penn Sate Trombone studio, as we present a concert full of music from composers like Ralph Vaughan Williams, Franz Schubert, Johannes Brahms, Robert Schumann and Richard Strauss. We hope you can join us for a recital dedicated to showcasing many different and exciting pieces of music “sung on the trombone” by the members of our studio! The goal was to learn the song completely before we began playing it on the trombone. We will perform this recital with no music, not because we have “memorized” the music, but rather because we know the music that well. We will also use a TV to display the words as each person performs their pieces. The event will take place September 30th, at 6:00 pm, in the new Esber Rehearsal Room! The concert will also be live-streamed on our Facebook page!